George Müller was born in Germany on September 27, 1805. In his early life he was not an honest person. From the time he was ten years old he was stealing money from his father. As time passed he also stole from his friends. He finally was arrested and locked up with other thieves such as he, and even with murderers. In these dire* circumstances he began to take stock of his life, but it was still not enough to make him change his ways. He attended the University of Halle and had a friend named Beta who invited him to a Bible study. They talked of a loving God and knelt when they prayed. Müller's heart was touched and it was the start of a new life for him. He had an opportunity to teach German to some Americans at the University. This paid for his college expenses. He continued to study the Bible and began to preach. He dreamed of becoming a missionary. He was spared from going into military service because of his poor health. In 1829 he went to London, but became ill and was sent to Teignmouth to recuperate. There he met Henry Craik, a man who would have a huge impact on him. Henry talked with him about people who sold their possessions and gave to the poor. Müller was intrigued* by the teaching. He talked with the members of the missions board who were supporting him about this idea of living by faith and depending on God to provide when you pray. They said they would not support him on this basis. He wanted to preach where God sent him, not where the mission society sent him. Craik offered him a job as pastor at Teignmouth, a small congregation of 18 members. During that year he was rebaptized as a believer. He fell in love with Mary Groves who also shared his convictions. Within three months they were married. Mary's brother, Anthony Norris Groves, sold all to become a "faith missionary" They sold their possessions and gave the money to the poor. This inspired George and Mary to live a similar life. Later George and Mary had four children, two of which were still-born. Their daughter was Lydia, and they also had a son Elijah, but their son died of pneumonia when he was very young. In his early ministry he had four objectives. 1. To assist Sunday Schools, Day Schools, and schools for adults and to start new ones. 2. To sell Bibles and Testaments to the poor at low prices and even give them away if the person could not pay. At the church where he preached, the people rented the pews where they sat during the services. Müller thought this was unfair to poor people who could not afford to rent a good seat. He discontinued the pew rents and put a collection box at the rear of the church. More money was collected through free-will offerings than by renting the pews. After two years Henry Craik asked Müller to move to Bristol to work with him. In the 1800's orphans had no one to care for them and had to beg for or steal food in order to survive. People did not have pity on them, and the government put the children in work houses where they worked long hours under the harshest of conditions. Charles Dickens' story of Oliver Twist brought the plight* of these unfortunate children to light. In 1835 there were only a dozen orphan homes in all of England and Wales, but they charged fees to care for the children. Poor children who became orphans had to move in with relatives or were sent to work in the workhouses. Müller began to pray about starting an orphan house. Money began to come in even though he didn't solicit* money from people. His vision was for the orphan home to be for children who were truly orphaned, having lost both parents. None would be turned away due to poverty or race. The children would be educated and trained for a trade. "God will provide", he said. He talked with people about the need for caring for these waifs. Gifts of furniture, money, dishes etc. began to come in. Müller kept a detailed record of every gift. People showed up offering to teach and work in the orphanage. * He found a place to rent. Everything was ready, but they had no orphans to care for. He had forgotten to ask God for the orphans. He prayed again and they started coming. The first house he opened was for 30 girls, then he opened a second and a third house. The first two years went well, but the next seven years were hard. Sometimes mealtime arrived, but there was no food. They would pray and at the last minute food would be brought for the children. During Müller's lifetime he gave away $700,000 that had been given to him for his personal needs. He spent hours every day studying the Bible and praying. He felt that God was calling him to care for even more orphans. After five weeks of prayer he determined that God wanted him to build a large facility. It would be expensive, $18,000. That's the equivalent to $1,000,000 in today's money. He found seven acres at Ashley Down that seemed to be the perfect place. The landowner reduced the price for him. Müller would not go into debt to build. He had to have the money in hand before he would start building. Economic times were hard, but after 2 1/2 years he had the funding. Two years later in 1849 the first building was completed to house 300 children. Over the next 21 years four more homes were built in which over 2,000 children would be cared for. Charles Dickens heard a rumor that the children in Müller's care were starving, so he went to Ashley Down to see for himself. He was so impressed with the good care they were getting he wrote the article "Household Words" for the newspaper in November 1857 telling about the work. James Wright became Müller's helper and the older man trained him to be his successor. * Müller's daughter and James were married. Müller's wife Mary died and he later remarried. Susannah Sangar was 16 years younger than George. She, just as Mary had been, was an excellent helpmate to him. With his son-in-law James to run the orphanges, Susannah arranged speaking tours for her husband, who was now 70 years old. She said he needed to tell others his message of depending on God for everything. The couple traveled all over the world. On one voyage off the coast of Newfoundland* the fog was so thick the ship could not travel. Müller had a speaking engagement to attend in Quebec. The captain started to pray for the fog to lift, but George stopped him because the captain didn't believe. George prayed and the fog lifted and he was on time for his appointment. Later when they visited Washington D.C. they met with President Rutherford Hayes at the White House. They told him about their work in Bristol. Müller spoke in many places in America. In 17 years they traveled 200,000 miles, visiting 42 countries urging people to read their Bibles, pray, and rely on God. Susannah died when she was 73 years old. 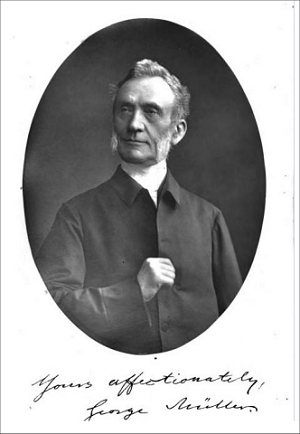 George Müller passed away on March 10, 1898 at the age of 92. Thousands of people lined the streets to honor him. Two thousand orphans were in attendance. In addition to caring for orphans George Müller also paid for the printing of Bibles and tracts. He gave away more than 250,000 Bibles. He paid tuition for hundreds of children to go to school. During his lifetime in answer to prayer he raised the equivalent of $129,000,000 which he gave away, and when he died he had only a little money left. The trust he set up continues to support missionaries around the world. It also holds the records for most of the nearly 18,000 children cared for during the 150 year life of the orphanage. 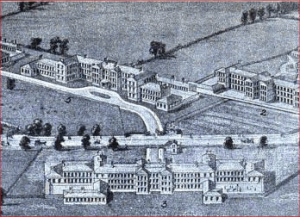 The British newspaper The Daily Telegraph wrote that Müller "had robbed the cruel streets of the thousands of victims, the gaels (jails) of thousands of felons, and the workhouses of thousands of helpless waifs"
George Müller's Orphanage at Ashley Down as it looks today. It is No. 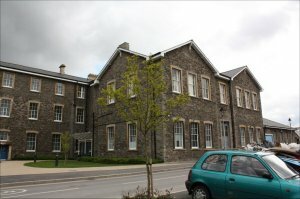 2 House which is now used by Bristol City as a college. Photo courtesy JoAnn Teo Flickr user. Some pronounce George Müller's name as M(Y)EW ler, but in the following video it is pronounced MOO ler with the OO having the sound of OO as in the word "good". Alan at mullers.org tells us that Müller himself pronounced it MEL er. George Müller Curriculum Guide by Julia Pferdehirt. To order see Library below. This biography by Patsy Stevens, a retired teacher, was written April 9, 2011. Press "Go" to search for books about George Muller. Wife and I spent a day on-site. VP Development Brunell Uni gave us superb tour, explaining many details of original construction, to how 5 bldgs used efficiently today. The nearby museum is truly a hidden treasure - little known about it. Müller actually met Craik in Teignmouth, where he was sent to recuperate after taking ill in London. Müller wanted to preach where God sent him, not where the mission society sent him - this is why he resigned. On his return to Teignmouth, Craik offered him a job as pastor. He then met Mary, whose brother Anthony Norris Groves sold all to become a "faith missionary". It was this that inspired George and Mary to live a similar lift. The Müllers had four children, but two were still-born. The sea captain (Joseph Dutton) didn't pray - Müller stopped him because Dutton didn't believe. Although the ü in Müller is pronounced ee-yew, Müller actually pronounced it as Meller. He was punctilious about putting the two dots over the u - he never "anglicised" his name to Mueller. The photograph is of No 2 House, and is now used by Bristol City as a college. He received, in answer to prayer, nearly £1,500,000 - around £86,000,000 in today's terms (or $129,000,000). The Trust he set up continues to support missionaries around the world. It also holds the records for most of the nearly 18,000 children cared for during the 150 year life of the orphanage. Thank you! We just picked up a biography of George Muller this week to begin reading. I appreciate the pictures you have added on this site to go along with our reading. This page displayed 45,769 times.